Washing Bag for Baby B’s Nursery | Keeps Me Out Of Mischief! Another nap for Baby B, another sewing session for Mummy! 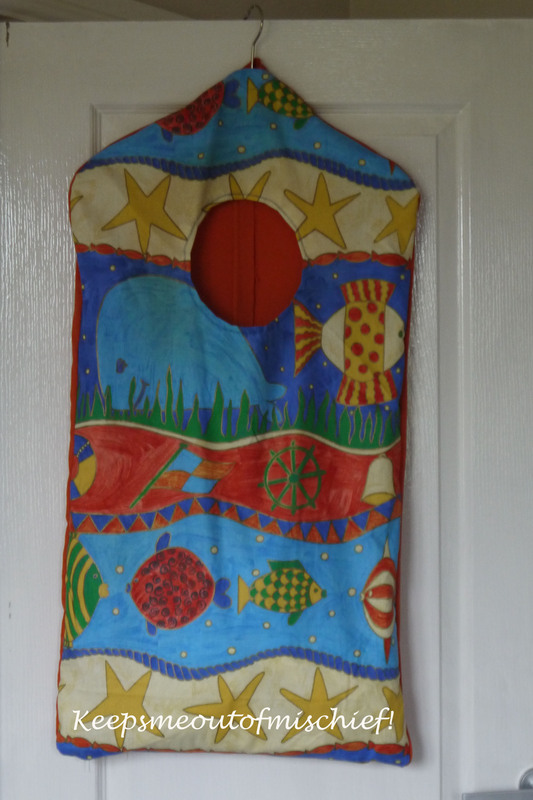 As a child we had a washing bag that was similar to this hanging in our bathroom. My mum was determined to train her girls to tidy their clothes up after they’d worn them! My favourite trick was to completely fill it whenever I was told to tidy my bedroom – this resulted in a very clean bedroom with no clothes on the floor but a very annoyed mother who now had a pile of washing to do! To make it easier for me to save me taking every piece of dirty clothing to the hamper in our bedroom while Baby B is young I decided to make a version using some of the leftover curtain material. 1 metre of your chosen front fabric design, 1 metre of the chosen fabric for the back (I used plain orange sheeting), 1 wooden adult coathanger, 1 zip approximately 40cm long. Lay the coathanger near the top of the fabric and draw around the top of it on the reverse of the fabric. Draw two vertical lines down from the edges of the coathanger markings. These lines need to be about 1 metre long but it really depends where you’re going to hang it, I measured the height of the end of Baby B’s cot because this is were it will hang. Mark where the hanger rises from the wooden part of the coathanger and draw a horizontal line just below this point. Add a 2cm seam allowance all the way around before you cut your fabric. 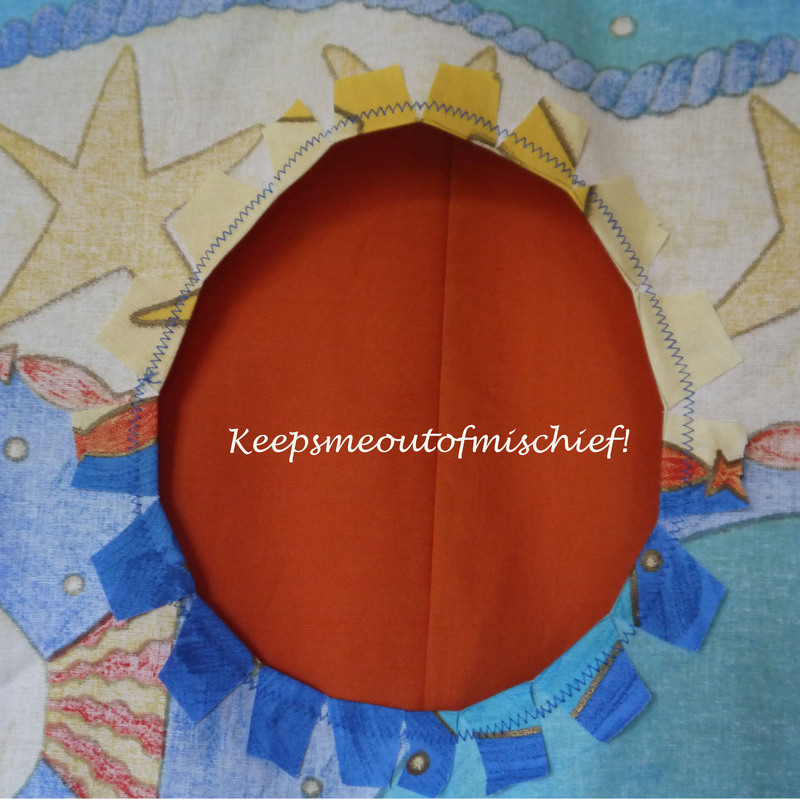 Place your fabric on your backing fabric and use it as a template to make yourself a copy. On the reverse of the front fabric measure down about 25cm and, using a dinner plate or similar, draw a largish circle. This needs to be big enough for you to reach through with a smallish piece of clothing in your hand. mark another circle approximately 2 cm inside this circle and cut out the inner circle. Cut out towards the outer circle and fold each wedge back before you sew around to form the clothes hole. Hem the top of each piece just where the hanger comes through. Sew a zip into the bottom seam like this then with right sides facing sew around the sides of the bag making sure you don’t sew across the bit where the hanger comes through. Turn the bag the right way through the clothes hole and poke the hanger through the hole.